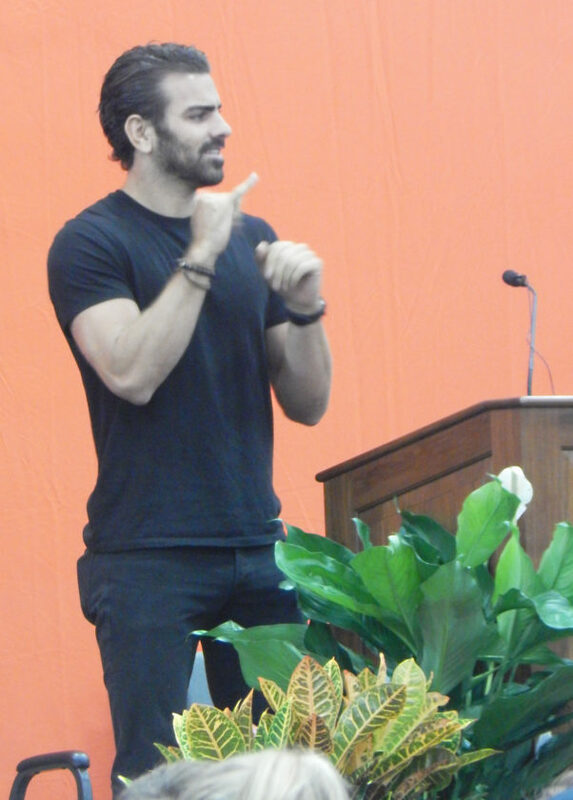 PHOTO BY NICOLE WALBY Nyle DiMarco signs during his keynote speech at Heidelberg University’s first HYPE event of the academic year. Nyle DiMarco was born deaf into a multigenerational deaf family and has been an honorary spokesman for Language Equality and Acquisition for Deaf Kids. DiMarco was keynote speaker at the university’s first HYPE event of the academic year. He is founder of the Nyle DiMarco Foundation, which works to improve the lives of deaf people worldwide. The HYPE program, in its second full year, teaches students about values, work styles, job search skills, communication, collaboration and conflict management. DiMarco said that when he was 24, he was asked if he wished he could hear. DiMarco said he learned to embrace who he is and his differences and to use those differences to his advantage. “If you know your differences and identity, you will make your journey so much easier,” he said. DiMarco said about 25 members of his family were born deaf, so he was raised by a family who knew how to raise a deaf child. DiMarco said one of his biggest inspirations is his twin brother, who also is deaf and is a disc jockey traveling the world. DiMarco said he found his identity while attending a deaf school in New York, where he grew up, and saw some peers with hearing parents who didn’t really know how to sign. DiMarco’s mother moved the family to Texas to an all-deaf school after he was required to attend speech therapy rather than learning core classes. “It was a culture shock at first, but I was able to finally be myself and learn more about the deaf community,” he said. DiMarco said he learned to thrive in a deaf community after attending public school part-time and the deaf school. After college, DiMarco was unsure if he wanted to pursue his goal of teaching mathematics, so he traveled for a year, visiting 42 countries. Soon after returning to the U.S., he was approached by The CW’s “America’s Next Top Model” and the show “Switched at Birth.” He said It was then he felt it was fate to pursue a career in entertainment. On “America’s Next Top Model,” DiMarco was the last model standing, winning cycle 22. While in the “Next Top Model” house, DiMarco said he felt alienated from the other models. DiMarco also has won the mirror ball trophy on ABC’s “Dancing with the Stars” season 22. He is a creative collaborator on The ASL App, created by native deaf signers to teach conversational American Sign Language.